At Muddy River Distillery, we make the best rum you've ever tasted by using premium ingredients, handcrafted recipes, and custom-built stills. Muddy River's first product Carolina Rum launched in September 2012. Our small batch rum is produced in a one of a kind still specifically designed and built by the company’s founder and head distiller to produce a premium quality rum with a distinctive, smooth taste. This rum has won awards including the Big Sip Cup. Check out the link below for recipes. After many rounds of trial and tasting, our Coconut Carolina Rum recipe was perfected. Coconut Carolina Rum is smooth and lightly sweetened with the taste of fresh coconut. Coconut Carolina Rum was launched in North Carolina ABC stores in June 2015 and was a hit for its first summer season. Coconut Carolina Rum cocktails coming soon. Our smooth Spiced Carolina Rum is delicious straight or mixed to create your favorite cocktails. Created from a unique blend of spices and a hint of vanilla and cinnamon, our newest product is a beautiful amber colored rum. After 2 years of recipe development, we released our true labor of love. Cheers! 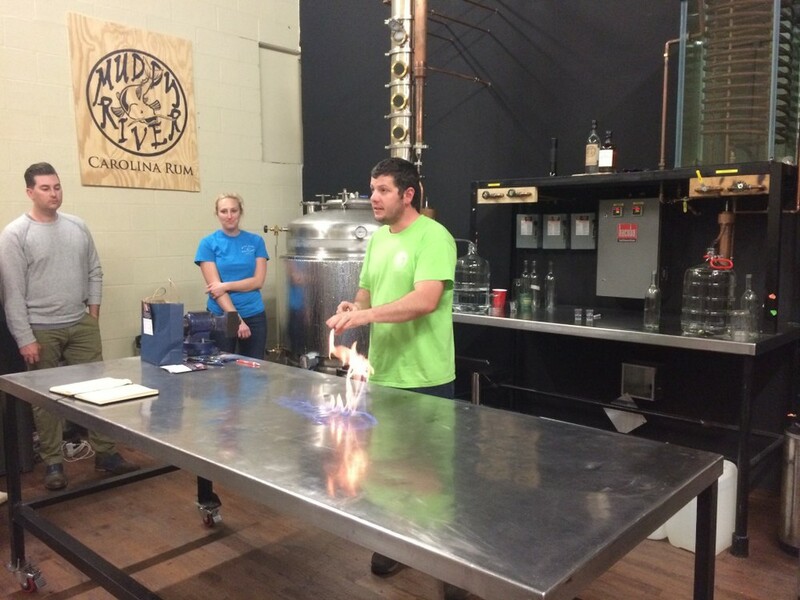 Schedule a tour today to visit Muddy River Distillery hosted by Robbi and Caroline Delaney. Trip Advisor ranks the tours as a top Charlotte activity! Order Muddy River Distillery merchandise and products from our online store. Store offers clothing, koozies and glassware. Learn more about the owners, the stills and processes. Hear about how we got started, what we care about and where we want to go.